If all has gone according to plan, I’m sitting on a beach right now, preferably with a decent base tan going (though more likely, a spectacularly uneven lobster-red sunburn), a fruity drink with an umbrella in it in hand and a good beach read. If it hasn’t gone according to plan, well… I hope I least still have the fruity umbrella drink. Last week I told you about a summer dessert I recently made for the very first time; today, I’m doing a complete 180. Not only is this dish of the savory sort, but it’s also been on heavy rotation on our weekly dinner menus ever since Deb first posted it on her blog. It’s one of our go-to meals when we want something fresh, easy and fast for dinner (which is basically every day because I’m impatient when hungry). Call me weird, but I’m OBSESSED with chickpeas. And I get all googly eyed when I see sauteed spinach. So when I first happened upon this recipe I knew I would love it right there, but then she had to go ahead and suggest serving it on top of fried bread toasts. And then I definitely knew: This was fate. It was my destiny to make this dish for dinner, and for many a dinner henceforth. And that is just what I have done. I’ll admit, this isn’t the purdiest little recipe you ever did see. But aren’t some of the ugliest foods the tastiest ones? And this one sure is tasty. It’s made with earthy, savory flavors like tomatoes, garlic, cumin and paprika, and it’s hearty in the best way possible: Filling, but not overly so in the way that makes you feel gross after eating it. It’s Spanish comfort food and, while it is the dead of summer and you might have more popsicles, cocktails and fruit salads on the brain, comfort knows no season. Sometimes, you just need a little bit of it in the middle of July. At least that’s how I felt, anyway, after making this most recently for what has to have been the second or third dozenth (is that even a word? Dozenth? Let’s go with it*) time. It felt like a conversation with an old friend — comfortable, relaxed, easygoing and without direction, just going where the flow led. And at the end of our conversation, we had a delicious dinner: one that stuck to our ribs, as it always does, in the best way possible. If you haven’t had the chance to make this dish before, I suggest you get on it soonest. As for me, I’ll be over here in the sunny sunshine state, enjoying vacation as much as possible — and when real life returns, I imagine I’ll be needing comfort in the form of this recipe again. *Looked it up. It’s totally a word. Heat a large skillet over medium heat. Add 2 tablespoons olive oil. 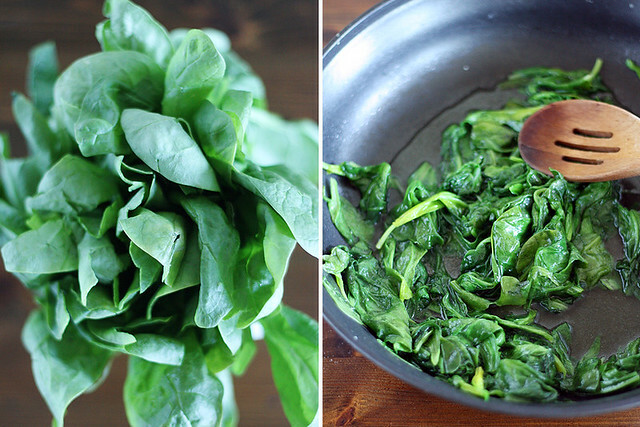 Add spinach and salt to taste; stir until just wilted. Transfer to a colander to drain. Wipe out skillet and return to medium heat. Add 2 more tablespoons olive oil and bread cubes. Fry bread until golden brown and toasted all over, then add remaining tablespoon of olive oil, minced garlic, cumin and red pepper flakes. Stir and cook one more minute until garlic is fragrant. Transfer bread mixture to a small food processor or bowl; add red wine vinegar. Pulse until a coarse paste forms, or use a fork to mash the mixture to a coarse paste. Return mixture to skillet over medium heat, along with the chickpeas, tomato sauce and salt and pepper to taste. Stir, cooking until flavors are absorbed and chickpeas are hot. Add spinach and stir, cooking until heated through. Add more salt and pepper, as well as lemon juice, to taste. 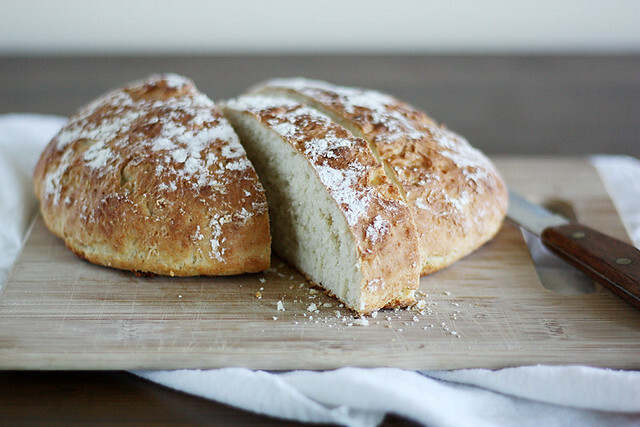 To make fried bread toasts, add a generous glug of olive oil to a skillet; place bread slices side-down in hot oil. Fry bread until golden brown and toasted on both sides, in batches if necessary. 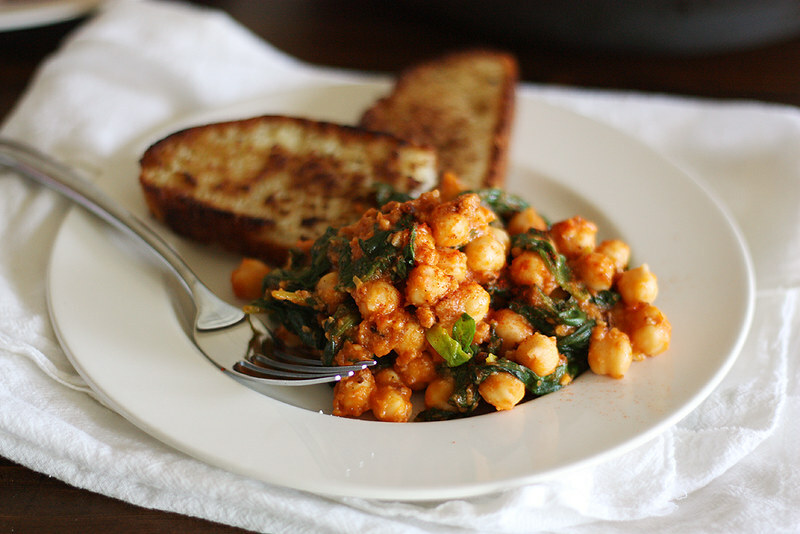 Serve immediately with spinach-chickpea saute, sprinkled with smoked paprika on top if desired. Oh yum it is like fancy baked beans! I love chickpeas and I especially like them on sour dough, it is like hummus only chunkier. I can not wait for the weekend to give this a ago. You can make any food look pretty. The deliciousness of any dish can not measured by pixels. Delicious – this reminds me of tapas that I’ve had before. And I wanted a big plate of it then, as I do now. Looks so food! What a perfect quick and easy summer meal! Looks delish! I never have too many chickpea recipes 🙂 Can’t wait to try it! This looks amazing! Adding it to my dinner rotation asap! I have never aquired a taste for (those dreaded) chickpeas but you really make them look delicious. Maybe I’ll get brave and try them again – lol! Chickpeas are always one of those things that I forget about until someone else makes them and I remember how much I adore them all over again! So comforting! I love chickpeas, I could easily make a meal out of this! I love this! It looks so delicious! 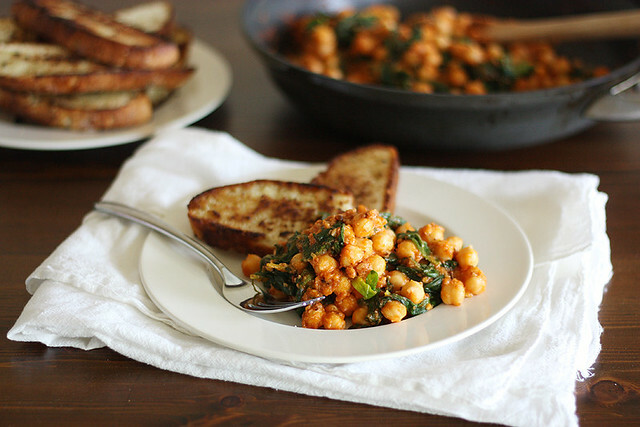 I adore chickpeas and this looks fabulous paired with spinach! I love all the incredible flavors and spices in this dish, it sounds delicious! Chickpeas are a huge staple in our house, and I think we eat them at least twice a week. I make something similar, it is called “cleaning out the kitchen” recipe and it usually happens just before we leave for a trip. Haven’t served with toast, but am going to add next time. It is really good with a poached egg as well. Thank you for making me …. really hungry! This looks so fantastic!! Gorgeous photos!! 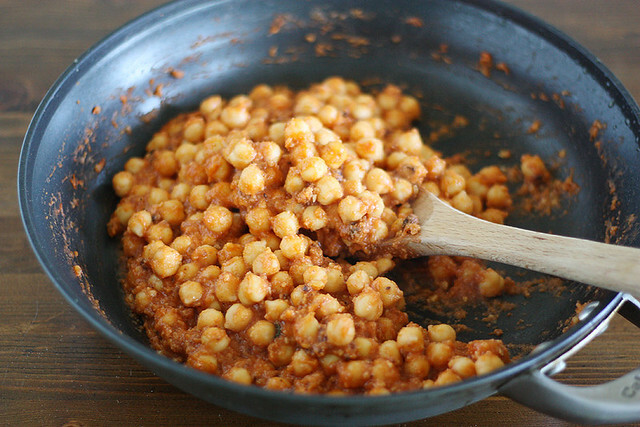 Chickpeas are so fantastically versatile. They taste great baked, fried, toasted, smushed…the list goes on! Not to mention how much healthier they are for you than meat 🙂 I’m trying out a new diet where I eat vegetarian during the week, going to add this to our list of weeknight dinners for sure. Caroline — Yes, LOVE chickpeas! And fried bread toasts. 🙂 Thanks, love! Sarah — Thank you so much, dear! 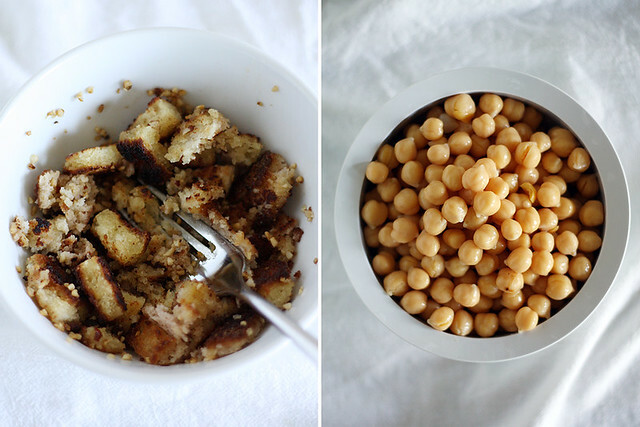 Erika — Heck yes to chickpeas! 🙂 Thanks, girl! Kim — Seriously, I can never get enough of them 🙂 Thanks! Heather — I know what you mean; they’re always delicious, but not always the first thing I think to eat 🙂 Thanks, dear! Laura — You totally should! 🙂 Thanks, love! Robyn — Thank you, dear! Denise — Ooooh, I know those meals all too well. 🙂 Loving the poached egg idea, by the way — I need to try that next time! Thanks! Julie — Oh thank you, my dear! Eva — Yes, I love how versatile and filling they are: a perfect vegetarian alternative, for sure. Thanks, dear! Can’t lie: I legitimately only saw the words “fried bread” and was all, “Girl, I’m down.” Add in chickpeas? I’m DEFINITELY there. This dish looks AMAZING. I go ga-ga for spinach and chickpeas also so this is definitely getting added to the dinner rotation! Oh this sounds so good. 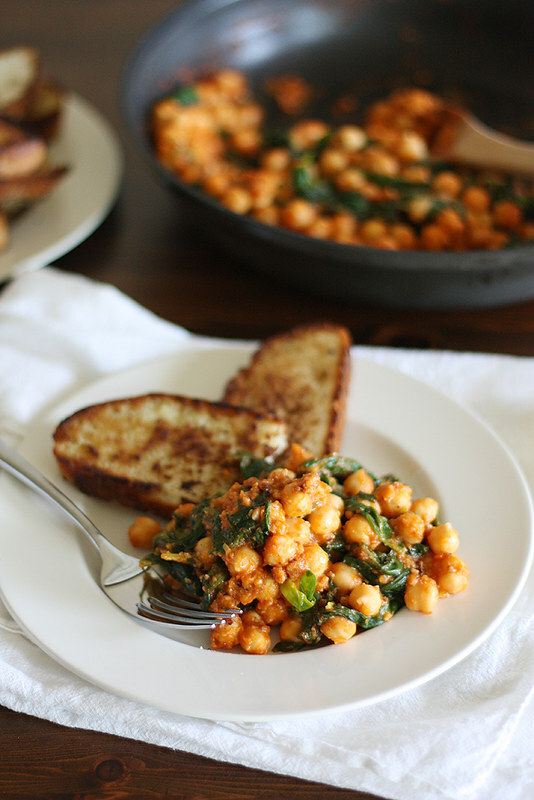 I love chickpeas and what a totally delicious way to eat more of them! A fruity umbrella drink sounds so good right now, even if it is before 9am. 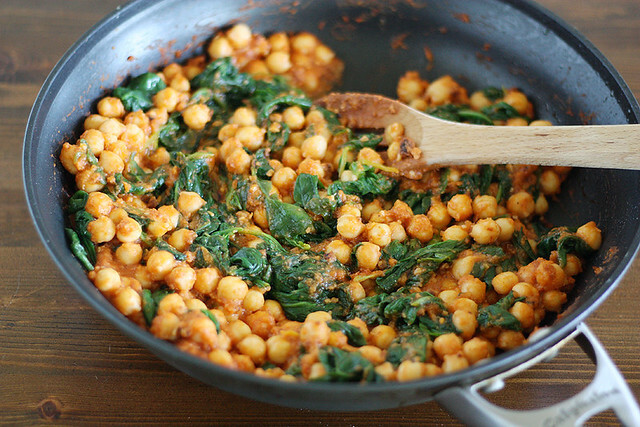 Spinach and chick peas are two of my favorite things, and the dish is actually really beautiful. Your pictures are to die for my dear!! MMMmmmm! Looks so comforting and easy. I hope you are enjoying your vacation. That looks absolutely amazing. Like, can I have that now? Yum. Kathryn — Thank you, dear! Mary — Thank you! Wish I could pass you a plateful through the screen! Just made this!! Turned out DELICIOUS. My family loved it. Thank you! I love dishes like this. And I get googly eyed when I see sauteed spinach too! Maria — Haha, I’m glad I’m not alone with the googly eyes! 🙂 Thanks! I don’t know if I commented on this before, but HOLYCRAP it’s gorgeous. Claire — Haha, thank you dear! I love this idea! It looks delicious…what a great idea! Thanks for sharing!